ANSAN, South Korea–(BUSINESS WIRE)–The world-leading LED company Seoul Semiconductor (Head office: Ansan-si, Korea, CEO: Chung Hoon Lee, hereinafter Seoul Semiconductor) announced that SunLike, implements light which comes closest to sunlight, received an RG-1 Eye Safety certification based on the safety of its light source and was recognized for the highest level of safety amongst 25W COB type LED. Eye Safety certification is a rating based on safety from analyzing the LED wavelengths. In Europe, where top priority is placed on the safety of lighting, Eye Safety certification is essential and the light source must be higher than RG-3 level, otherwise, eyesight may be impaired if stared at directly and there has to be a warning label on the finished product. SunLike received the RG-1 grade in Eye Safety certification with its natural light LED which applies TRI-R technology from Toshiba Materials (Head office: Yokohama city, Kanagawa Prefecture, CEO: Aoki Kokumei). The RG-1 grade is granted to a safe light source for which there is no biological risk, even if our entire lives were spent exposed to the light source. Particularly, the acquisition of the RG-1 grade for the first time for a 25 W single light source widely used for commercial and residential lighting is highly significant, as a natural light source with the highest level of safety has been commercialized. The interest in the impact of light on health has increased tremendously with the award of the Nobel Prize in Physiology or Medicine to professor Jeffrey C. Hall from Maine University, professor Michel Rosbash from Brandeis University and professor Michael Young from Rockefeller University of USA, acknowledging the causal relationship between biorhythms and human health. 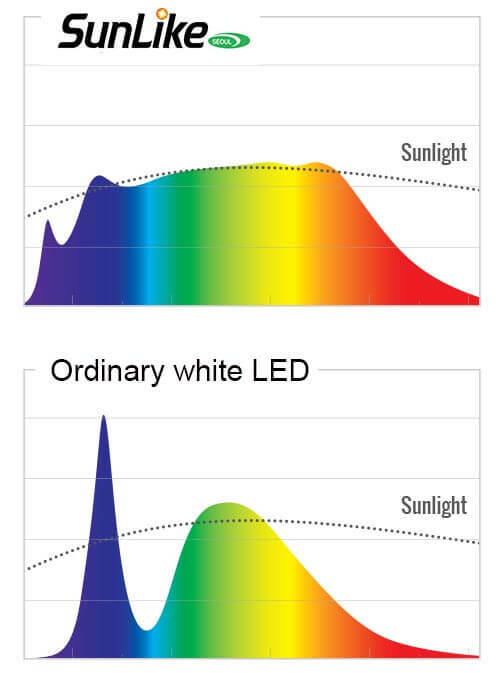 So the natural light LED SunLike, which acquired the RG-1 grade in Eye Safety certification, is in the spotlight as a next generation light source. In addition, SunLike doesn’t have the blurring problem occurring in most other artificial light sources and as a result, the unique color an object has comes out the best and the three-dimensional effect of the object remains intact. Thanks to these features, SunLike is expected to be widely applied, not only in places requiring a healthy lighting environment such as home, offices, schools, medical institutions, etc., but also commercial facilities, museums, clothes stores, distribution stores, etc. which have to reproduce the natural color and texture of the object. “Interest in the relationship between light and human health is increasing with the award of Nobel Prize in Physiology or Medicine by the scientists researching biorhythms and consequently also the volume of inquiries for SunLike from commercial, industrial and medical institutions, as well as customers in lighting, throughout the world,” according to Dr. Kibum Nam, Head of Seoul’s R&D Center and Chief Technology Officer. * What is TRI-R technology? TRI-R is a registered trademark of Toshiba Material Co., Ltd. It is a natural light LED light source technology that reproduces the solar spectrum developed by the concept and spectrum technology of natural light. Eye Safety refers to the international standard the International Commission on Illumination adopted as standard (CIE S 009:2002) which defines the standard of LED illumination for the purpose of safety for the eyes and skin. The relevant standard is defined in IEC/EN 62471. Since the luminaire was widely used for LED, the assessment of risks to blue light became integral and the standard of IEC/EN 62471 began to apply to lighting and system using LED from September the 1st, 2009.